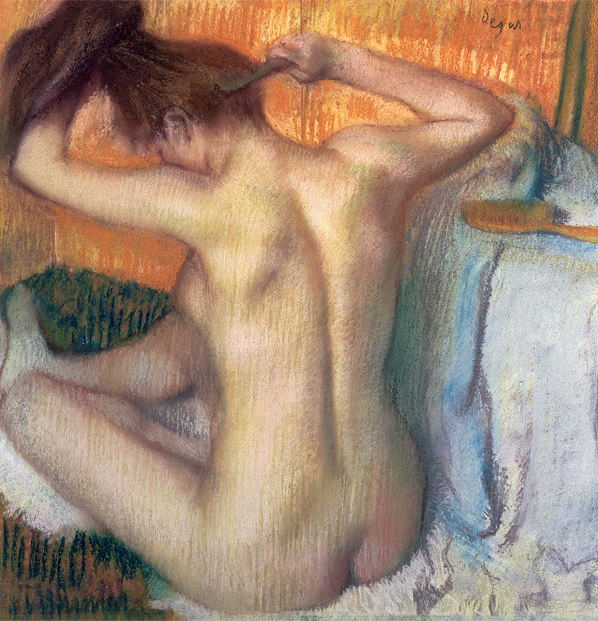 There’s a wealth of creative info to be had in the life and work of Edgar Degas. He was a precise, thoughtful artist with an evolved, academic drawing ability. Impressed by Japanese prints, Degas contrived compositions not seen before, snapshot cropping and happenstance placing that gave a sense of movement and the passage of time. Degas shunned outdoor work but is nevertheless lumped in with the Impressionists. 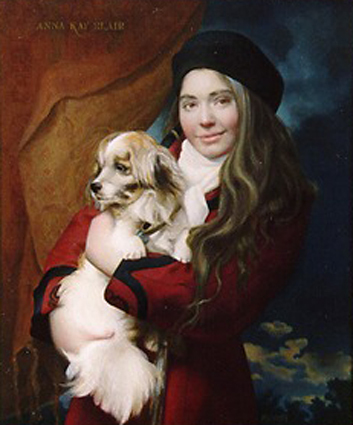 His subject matter was wide-ranging and eclectic–historical and classical scenes, horses, dancers, café life, figures, sports, women at work, portraiture. His media included oil, chalk, pastel, pencil, engraving, mono-print, sculpture and photography. Degas first noticed his eye problems when he was a national guardsman in the Franco-Prussian War in 1870-71. With a blind spot in the center of his right eye, he was a poor shot. By 1890, his left eye also began to deteriorate. Looking sideways at his work, he used peripheral vision to compensate. Much has been written and speculated about Degas’ eyes. 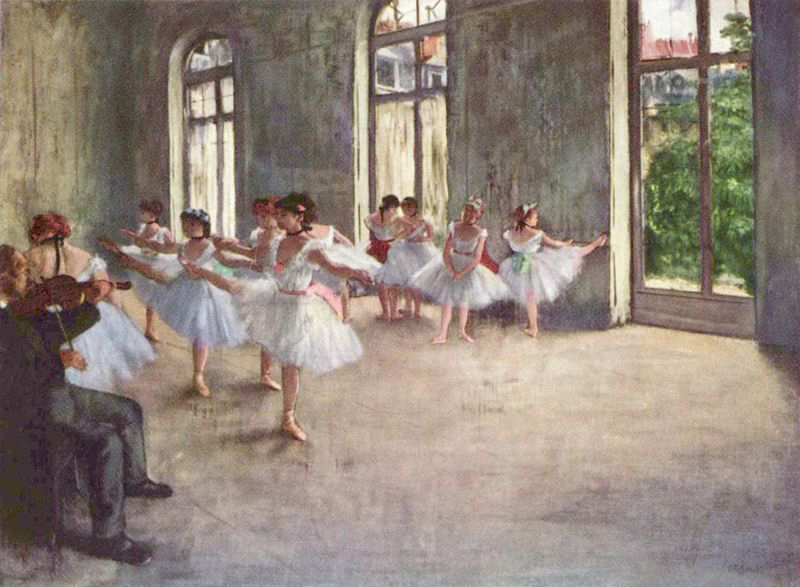 Stanford ophthalmologist Dr. Michael Marmor has used computer simulations to gauge the problems and mimic the blurred vision that increasingly affected Degas’ ability to see form and line. Noting the changes that came about in his later works, some observers feel that while Degas’ draftsmanship lost realistic description and refinement, it gained in grandeur and expression. Edgar Degas (1834-1917) often turned to sculpture. You can understand the appeal by blindfolding yourself and putting your hands on wet clay. Form can be felt as well as seen, and it’s even more voluptuous and expressive in the hands. Degas’ sculptures rival Rodin’s. He wound up his working life about 1912. Degas spent his last years dejected and alone, imprisoned in his advanced disability, having outlived many of his friends. During the mid-1880s, he first began to talk about his ‘infirmity of sight. 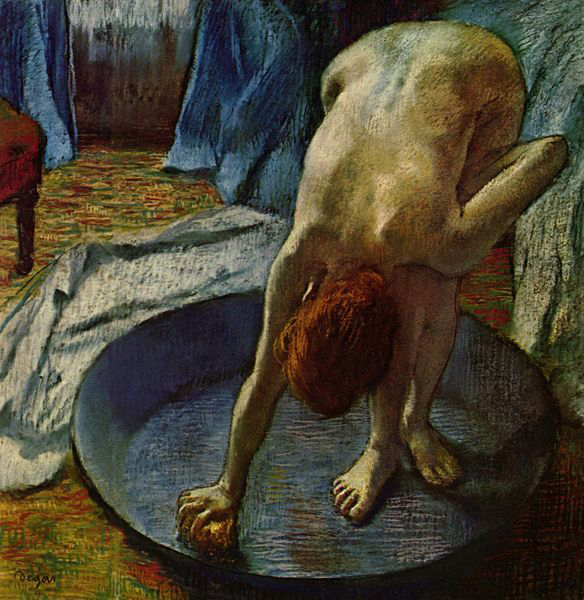 By the time Degas completed ‘Woman Drying Her Hair’ in 1905, his eyesight had dropped to somewhere between 20/200 and 20/400. Marmor notes that after 1900, there was virtually no detailing of faces or clothing in Degas’ artwork. I prefer Degas’ later, less detailed paintings. They get to the point without dressing it up too much. The technical skill to render precisely is sometimes a disadvantage–you want to exercise that; put it to what you think is good use–but the result is often less visceral. I recall a few paintings by Norman Rockwell in his later years. He couldn’t paint the realism that he was accustomed to. The results were powerful. Sometimes what we think is our strength actually detracts from our ability to express ourselves. Myopia – the artist’s friend? 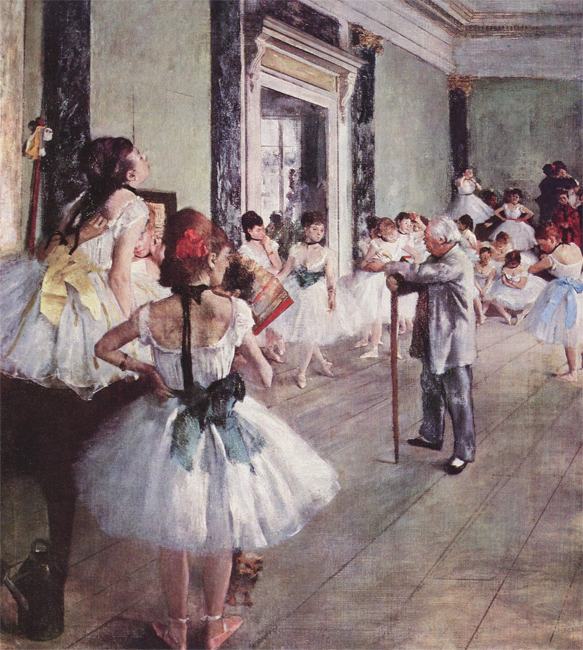 As a short-sighted artist I found the story of Degas’ failing eyesight fascinating. How often do we truly get to see through someone else’s eyes? 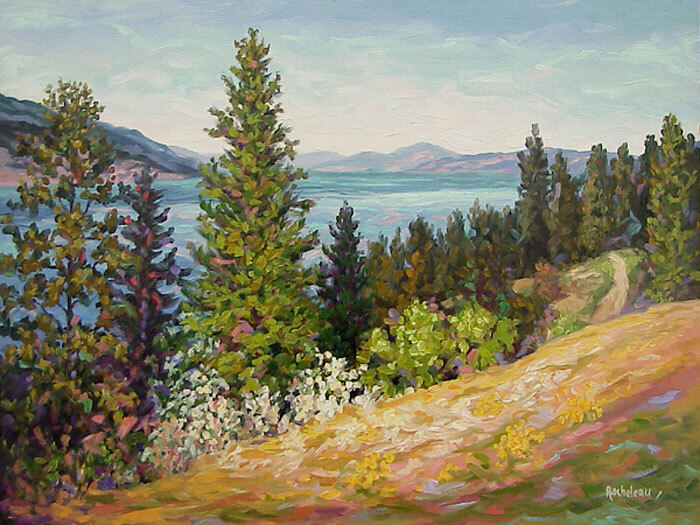 When I construct my landscapes I paint what I see – which, without my contacts, is very little clearly! My paintings reflect this and I make no apology for it because the viewer gets to see exactly what I do. I rely on light, colour and shape to dictate the feeling of my paintings and very rarely include detail, because detail is something that eludes me! However, I do find this loss of detail comforting. In my distorted world things become far simpler than they really are! 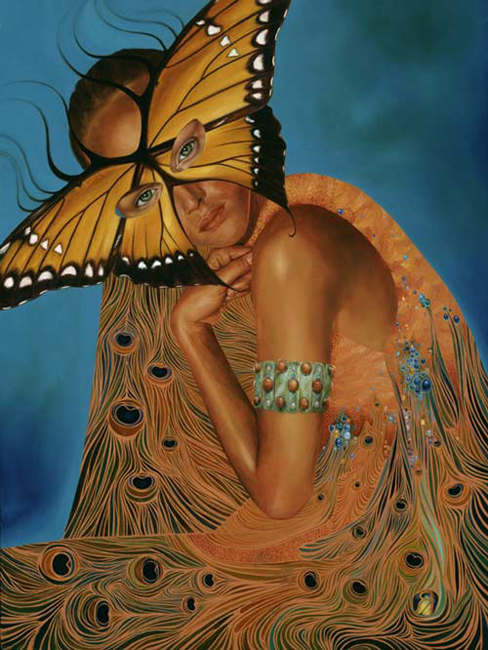 I wonder how many other working artists have major “eye problems.” I am blind in my left eye and have poor vision in my right eye… yet I make my living as a portrait painter. I have met several other working artists with similar poor vision and somehow we all think that it helps rather than hurts our art. 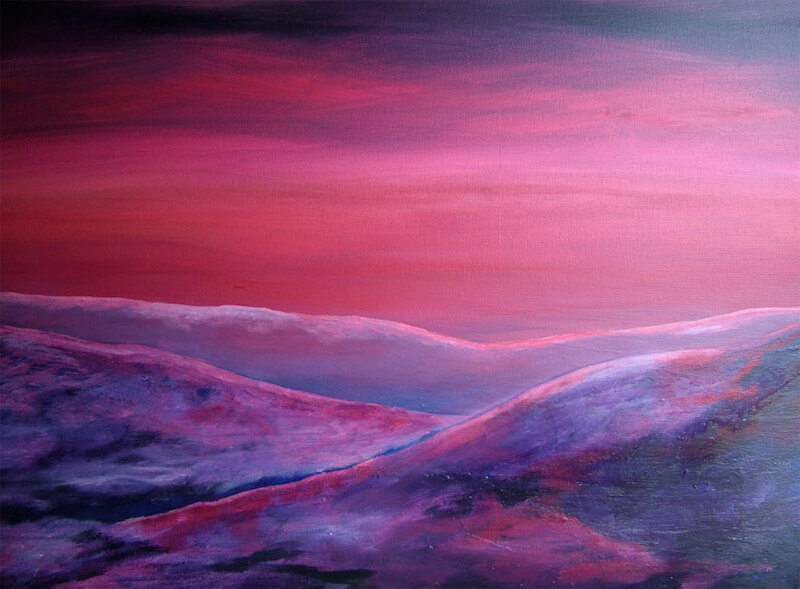 I do not have depth perception and hence landscapes are very challenging for me to paint. I do well with a shallow field such as a portrait or a still life. Declining sight and diminishing powers of perception and memory can be terrifying prospects for an artist. There is a well known Michigan artist, Armand Merizon, who is still producing work into his late eighties with macular degeneration. His mind is sharp and he still participates in critiques with the Grand Valley Artists. The highlight of critique night is the showing of his recent work. 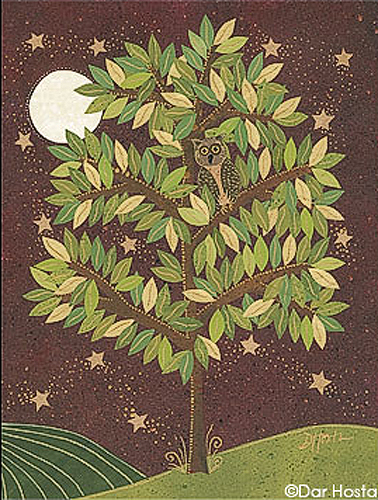 His work is still beautiful, though more abstract. There was a documentary recently made about his life including his current visual challenges. I know your letter was about eyesight, but what stands out to me in this letter is how Degas lived his last years, in your words, “dejected and alone.” Degas was my inspiration in art school, the reason I pursued painting in soft pastel. It interests me that talent and accomplishment are not a sure ticket to happiness. Success in one area of life does not equal a successful life. 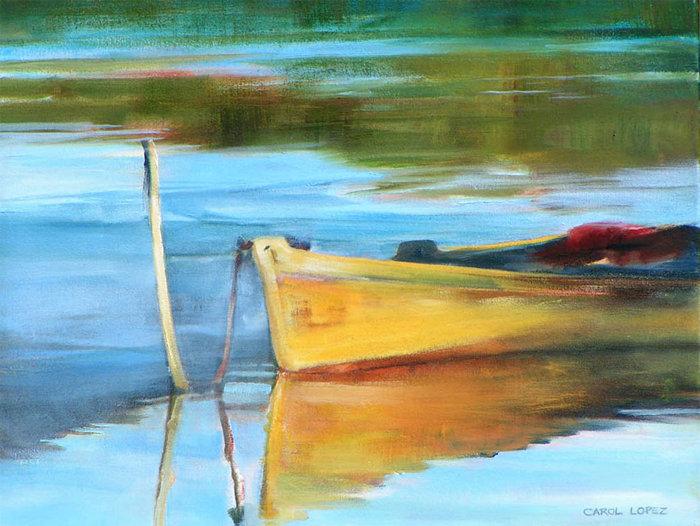 While painting might be a very important part of our lives, we must not neglect the whole. Artists by nature are passionate individuals, and it is easy to lose sight of the bigger picture because we become consumed by painting the smaller ones. It is interesting how many artists through the years have had declining sight. Unfortunately, I am one of them. I have Fuchs’ Dystrophy. Depending on my overall health, when the time comes, I may be eligible for transplants. Are you aware of Lisa Fittipaldi of San Antonio? 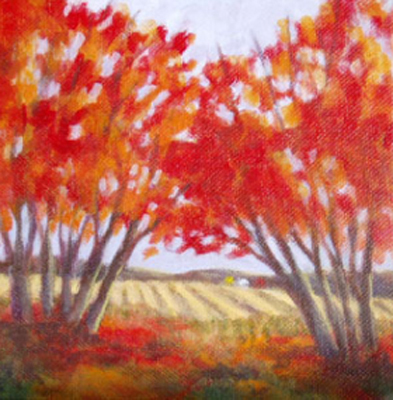 She is an artist who only began painting after she became legally blind. 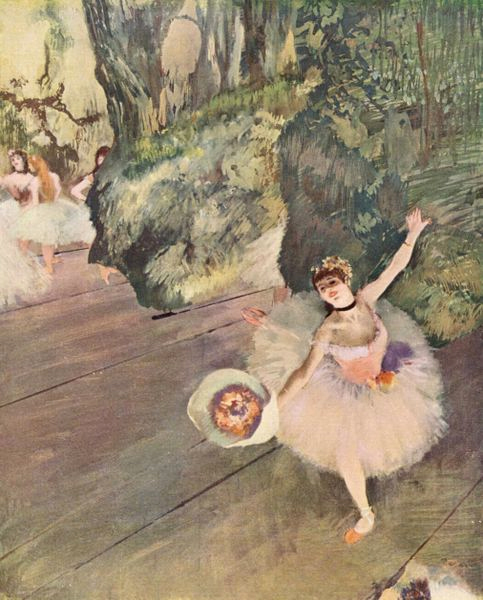 I do not know if Degas might have benefited from a lens implant, but I certainly have! The ironic part is that the implant is trade named AcrySof, because it is made from an acrylic polymer, the very same substance found in Plexiglas and in the paints I use each day. Thirty years ago, I noticed that I had a warm eye and a cool one. Critics of my work also said that they were oversaturated, but I dismissed this, having been assigned better than average vision. I was out of the game of painting pictures for four years, when like Degas, I suffered from a sudden loss of eye-hand co-ordination. By the year 2000 the big “E” on the eye chart looked like three heavy parallel lines and my peripheral vision had vanished. I stopped driving a car and was soon diagnosed as having glaucoma. The good news is that little bit of acrylic brought my vision back to 20/30. I wonder if other artists have had this same result. 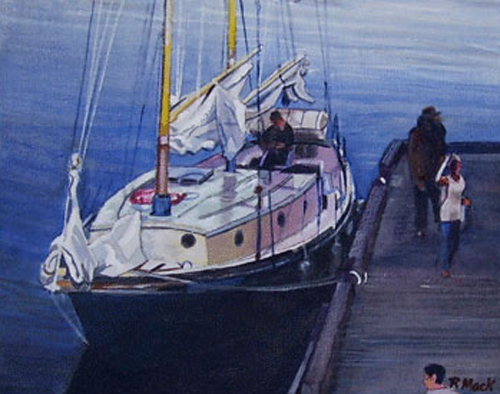 I have experienced different types of paint, brushes, strokes, thinners, methods, strategy. I went to a restoration specialist in France which is restore old paintings in south France and she thought me to stretch and prepare the canvas like in mediaeval times. She thought me also how to create folds and depth. The title Pantha rei felt natural to me, since I did not make a copy. And to copy a glimpse of the universe that is just flowing would be quite bizzare. It was through my background investigating on Heraklit I found that it was something called “Pantheism.” Voila, ma révérence pour la nature c’est ma vie. When I started to paint Pantha rei it was from an unforgettable inspiration the NASA Hubble Telescope team had given me. When I saw the “Orion Nebula” on their website, I was sold. 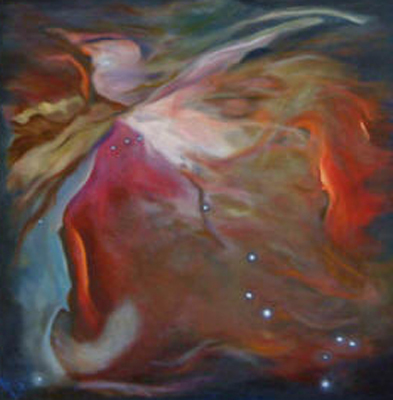 By the time my painting was finished, the Orion Nebula picture had been the most popular and very known. Only time can remind us what a marvel this world is… I was 13 years old when I sketched a pair of eyes in ball point pen on a napkin at my grandmother’s kitchen table. It was a bit of a surprise to me, on my next visit, to find that grandpa had taken that tattered little napkin, and tacked it up to the esteemed wall where all the photos of the beloved family were proudly displayed. The eyes reminded me, each time I would visit, how much my grandparents adored me and how proud they were of my talent for art. But it wasn’t until a few years later, when my grandmother told me how Grandpa’s eyes had been progressively deteriorating from macular degeneration, that I truly understood what it was about that little sketch that was so very precious to him. Today Grandpa is clinically blind, and he needs help from others just to accomplish the very basic of life’s routines. When he touches my hand I see, revealed upon his face, the heartache… he can’t see his fully grown granddaughter. How brilliant life is… what an unfathomable gift that we have, to share in this beauty, this miracle. How cruel to recognize aging, as it withers and dims all that once was. It only serves to remind us, and compel us to capture these fleeting and precious moments in paint, and to seize every inspiration as if it were the last. You may have already thought of this, but I wanted to encourage you to hold back some of your first editions when you get to the end of your run. There is a particular “Signed First Edition” market out there and they can become worth much more than their sticker price on down the road of time. You may want to contact a wonderful book store in Jackson, MS called Lemuria Books. They specialize in signed first editions (some worth thousands by writers like Twain and Faulkner), it’s definitely their “thing,” and they have purchased many of mine. I found them by chance and have developed a very nice, personal relationship with them over the years and they have always been enthusiastic about my work and my independent production of them. If you get in touch with them, talk to Yvonne first, she is a lovely, art-loving southerner who loves to talk to folks who make books. Robert, Your letter regarding Degas and failing eyesight arrived at a significant time for me as I was considering sending a letter to Painter’s Keys about the issue of artists and the way in which changes in their eyesight influences the development of their work. I’m 62 years old, a sculptor and am currently half way through having refractive lens exchange surgery in which my lens are removed and replaced by artificial lens. This is done with a local anaesthetic. It’s an interesting experience to be spoken to by a surgeon whilst he’s cutting into your eyeball with a scalpel. My left eye was done last week and my right will be done next week. In the tests prior to the operation the surgeon used a computer simulation to demonstrate to me the age related changes that occur in the refractive lens. Amongst the changes a particularly significant change for artists is the gradual yellowing of the lens, creating a sepia like tint to the world. This is a gradual process and over the years develops unnoticed. In my present state, temporarily having one ‘new’ eye and one ‘old’ one, I can demonstrate this change to myself by first shutting one eye and then the other. The ‘new’ eye gives a clarity of vision that I’ve never known before but it also gives me an intensity of colour that has come as a surprise to me. The world is a bright, colourful place, the full intensity of which I must have known in the past and was unaware of it having gradually faded as I aged. When I shut the ‘new’ eye looking at the same scene with the ‘old’ eye I’m aware of the yellowing, sepia effect and wonder how artists can, short of having refractive eye surgery, be aware of and make allowances for these changes in their vision due to age. After the second operation I’ll lose the ability to make this alternate ‘blinking’ comparison between the two states of my vision. It may well be that this subject has been aired in the letters previously. It’s not magic, I believe art can happen with or without sight. Try it, blindfold yourself to full darkness. The darkness leaves you in about 10 minutes and you sense the light in the room, or that was my experience anyway. Voices dim. Creating on paper with pastel or charcoal, whatever, surprize yourself! The last comment reminded me of a time when the hours went by and I did not notice the darkness had fallen over my room. A friend “awakened” me at my easel, and put on the light. 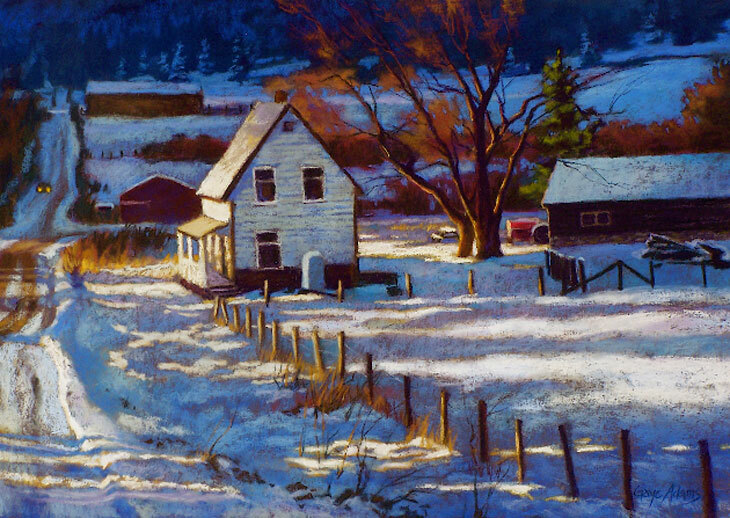 All colors were perfect, and the scene I was painting! I exclaimed “Who is painting through me?” Today when a painting turns out just as I had planned it, I wonder…the light is evidently within. If your sight seems to be poorer, or the light dimmer, get checked for diabetes. Happened to me, but I was lucky, and regained my sight with diet and medication, not everyone does. 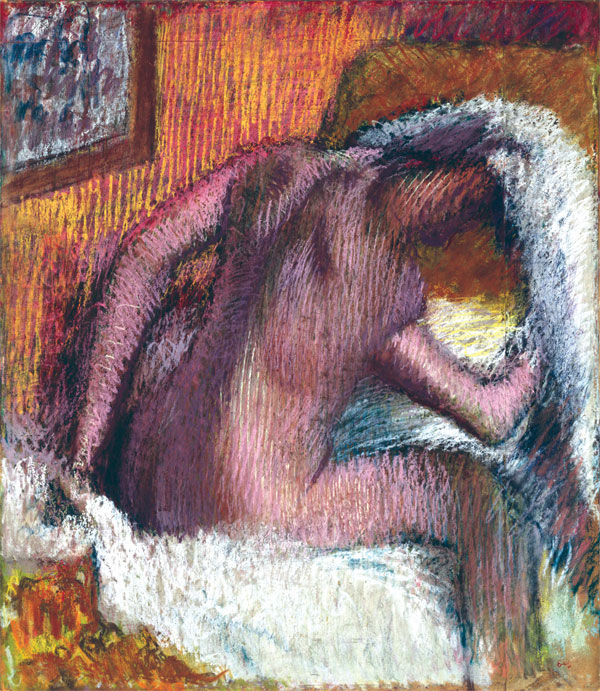 I was in a museum some years ago where a docent showed us a Degas pastel, one of the later woman-in-the-bath ones, and he showed us how Degas had added another piece of paper to the original painting. The line showed faintly through where the piece had been added, but it did not detract from the composition at all; in fact, it was wonderful to see his mind at work as he altered his original painting. I agree that his later work is more powerful. Monet also had declining eyesight as he aged. Anyone who has seen the water lily paintings in Paris can attest to his continued ability to paint his world despite his declining sight. I love reading about the lives of artists who have undergone great obstacles and yet continued to create. Their difficulties allowed them to approach their art in a unique and individual way. Django Reinhardt comes to mind. For every door that closes, a window opens. One of my painting students the other day said she had removed her glasses and had the realization that perhaps she “should do it more often”. I wear glasses, but not necessarily when I am painting. I prefer the abstraction that occurs, although I do not have some of the extreme afflictions that some of the other entries share. I do have one artificial lens and I wear glasses mostly to read. In short her observation brought to light your article about Degas and others. I have shared the information with the class. I now leave it up to the individual whether he or she wants to wear glasses while painting (entirely, or at intervals.) This is a new approach and the article was the inspiration. It gave me a source to share as to why I don’t wear my spectacles while working. Let’s see where this experiment leads. Thanks. www.ronfritts.com. With my right arm in a sling after injuring my shoulder, I still attended my life group, working with my unaccustomed hand. I am someone who sees, draws and paints too much detail. Well,I felt rather pleased with the results of my lefthanded effort. Then an experienced senior class mate said, “Great work! Now all you need to do is leave your glasses at home!” Ive never forgotten that, but have yet to Let Go and paint with such abandon, tho I agreed with him. I remember also being advised to “get to love my Blur” with specs off more often. Ive not been kind to my eyes in my youth and Im going to pay the consequences with advancing age. I didnt take care of myself when young thinking myself indestructible. This is the foible of all the young. I never saw myself as vulnerable. Adding to the fact that Ive never broken a bone or had to spend time in a hospital. Im hardly ever sick. When I am I thankfully recover quickly. I dont have allergies and sleep well at night. As a result I feel all this is coming to an end and I will have to pay the piper soon. If I should be so unfortunate as to lose my sight, Im not sure I could continue on. I would not be able to paint. I would not be able to see the beauty surrounding me. That would be too hard to live with. Ive read of artists losing their sight thus making their quality of life less than desirable. I could live with loss of hearing or loss of a limb if that were my fate but loss of sight is unimaginable. Years ago I blindfolded myself for a day to experience blindness. I did this while at home. I did not venture out. You become aware of your limitations. Everything you do and know becomes an obstacle to overcome. Simply moving from one room to another is a chore. Not have enough courage to use the stove when hungry I ate only cold food if I could find it in the refrigerator. Overall all these daily functions pale in comparison with not being able to create art or experience art anymore. Ive read stories of sightless people overcoming their loss and living normal lives, but I dont think any paint. At least not the way I would want to get the results I require. You dont give much thought to loss of sight when young. I dont think one can prepare for it anyway as we do with retirement. Sight may be THE key sense of all the sense. Being tossed into darkness is horrifying especially for an artist. You cant paint in Braille. I guess what is most important is the sighted time we have and to use it wisely and appreciate the wonders of what this world had given us. Beauty is not in the eye of the beholder, beauty IS and if we can see, we behold it.